A Course in Miracles helped me find my own internal teacher. T﻿﻿ime is a paradox. It is experienced differently by each and every one of us. As a young man I sought an answer to the time paradox. That question eventually led me to A Course in Miracles. Explaining that time is an illusion of our making, leading to an understanding that my perceived reality cannot be what it seems, A Course in Miracles not only helps answer my initial question related to time, but also holds great practical benefits for living my life: benefits like leaving fear and worry, guilt and regret, and simply giving peace where there was anxiety and apprehension before. about the world around me and the greater reality we all share. Meet the Author Upcoming Event! Carey Jones found the Seth books by Jane Roberts more than twenty-five years ago. That was the beginning of a personal course of study that eventually led him to A Course in Miracles and writing Time's Illusion. He is also a veteran of the first Gulf War and wrote about the experience in his first book, Faraway Thunder. 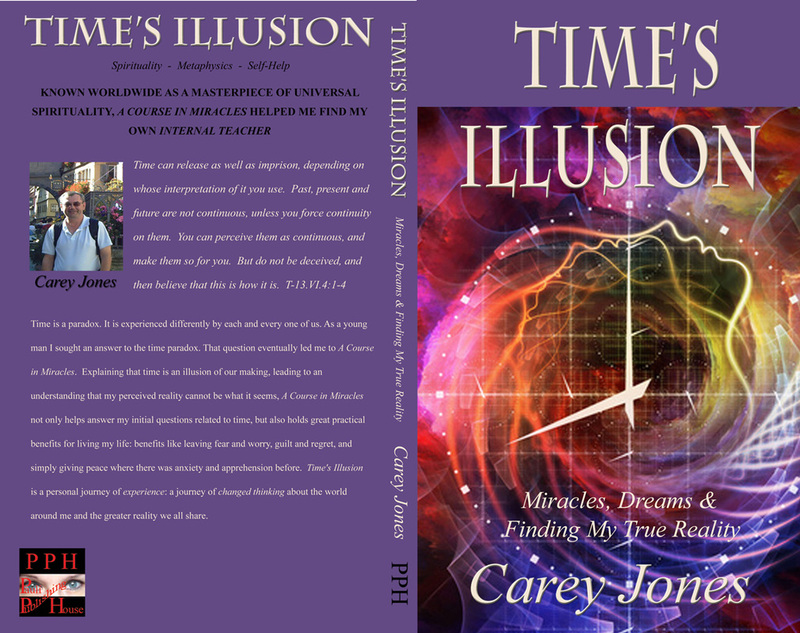 His journey of healing and changed thinking are at the heart of the story in Time's Illusion. He lives in the Minneapolis, MN area and working on his next book. Copyright © Carey Jones Books. Reprinted by permission. All rights reserved. Is it Really a Dream? I met a homeless man; a white bearded older man overdressed for the July heat, sitting on a street corner in the downtown area of the city where I lived. The homeless man had his hat out and I walked up and dropped in a few dollars. I asked if he had a place to stay and the man said he had a van to sleep in. I asked him why he didn’t use a shelter and he told me they were too dangerous and full of drugs. I looked over at a little sign the man had made up saying he was a veteran and homeless. I told him I was also a veteran, and he asked what war I’d been in and I told him. I asked about his story and the homeless man said he’d served in Korea and I commented on how cold I knew it had been during that war. He said it was the coldest he’d ever been; thirty to forty below zero and living in a foxhole. We talked about the VA, and the homeless man said he had some aches and pains but was getting some attention there. I told him there were a lot of things happening in America at the time that gave me a lot of opportunities for forgiveness and that got a chuckle. Before I left the homeless man, I knelt down and asked, "You know this is a dream, man?" Looking directly into my eyes, a quick smile came to his white bearded face. "Oh yeah," he said. He’d given an instant reply. Is this life really a dream? My reason for asking the question to the homeless vet was to give comfort in a way. If this life is not reality as we understand it, then what the homeless man was experiencing could not "really" hurt him. I thought that maybe it can be taken a step further. If this life, this world, is maybe just a dream, is it possible then that no one can really be hurt by anything happening day-to-day in it? I asked myself how I could use this realization in my life. The first thing that came to mind was the elimination of fear. In many things I’d read, eliminating fear in one’s life is a major topic. It seems to go back to the basic truth that what we think we become. Nowhere in the material I was reading was there room for fear, worry or anxiety. Fear, worry and anxiety destroy. They should have no place in our psyche, and further, need to be eliminated from our conscious and unconscious thoughts. But, we are only human. Thoughts happen, right? Later in my reading, I found a topic associated with discipline of mind, and it relates here: to discipline where I go with my thoughts is crucial to overcome having thoughts of fear, worry and anxiety in the first place. What I thought was important about the realization that the world is most likely unreal, and the perceived reality I was living is maybe just a dream, is that if this idea is consciously realized in waking moments, I could understand that the fear thought I may be having at any particular time could not be real either! How is it that the old man on the street corner seemed to know about the dream as soon as I asked the question? I pictured this conversation often. The homeless man’s smile was immediate. I believe he knew the truth. Maybe when people hear the truth, they instinctively know it is truth. Of course, the conscious mind will bring in its version of reality and color what a person hears very quickly, but for an instant maybe all of us can hear it. Copyright © Carey Jones Books. All Rights Reserved.